You Are Here: Home / 2017 / Journals / Monkton Old Hall: a fifteenth-century manorial courthouse? Monkton Old Hall is a late-medieval hall-house, prominently situated just southeast of the churchyard, and former priory precinct, at Monkton, Pembroke (Fig. 1). There appears to be no record of either its construction or its purpose. An ‘end-hall’, it comprised a hall and two-storeyed service-wing over a rib-vaulted undercroft; a further wing formerly existed at the northwest end. A three-storeyed kitchen wing was added to the service wing in the post-medieval period, giving the current T-shaped plan. Ruinous by the late nineteenth century, the building has undergone several restorations. No detailed study of the Old Hall has been published, despite its considerable interest and the uncertainty over its function. The numerous short accounts, sometimes conflicting, include descriptions by Joseph Cobb and Leonard Beddall-Smith, who restored the building in 1879-80 and 1979 respectively (Barnwell 1868, 70-3; Beddall-Smith 1982; Cobb 1880; Emery 2000, 681-2; Listed Building report; Lloyd et al. 2004, 298-300; Smith 1988, 22, 28-9 including cutaway drawing; Thomas 1962, 344-5; Turner 1853, 321-2). The medieval work is clearly of two phases, distinguished externally by joints and differing facework. Original detail, though scanty, is however very similar in both phases: all external door surrounds are in chamfered local limestone, with slightly rounded two-centred heads. Very few original lights survive. Phase 1 embraced the hall, undercroft and the northern part of the service wing, to form a rectangular block. They are of one build with facework, in uncoursed local limestone rubble, showing no sign of joints or breaks. The superstructure is a metre wider than the undercroft, while the internal divisions in the two do not closely correspond. This may suggest a slight change of plan during construction, dictated by the very wide cross-passage (see below). No time interval is necessarily implied; the superstructure overlies the undercroft side-walls, which are thicker, and the stair between the two is of one build with both levels. The undercroft is a long chamber of three bays. It has a simple, quadripartite vault with plain, square-sectioned ribs and no ridge-rib (Fig. 4a). A contemporary stair in the north wall follows a loose arc up to the service rooms, and a similar stair (now blocked) led to the former northwest wing; both doorways have been altered (01 and 02). All other features are secondary insertions. At ground-floor level, the Old Hall is divided equally, by an internal cross-wall, into a hall and cross-passage/service rooms. The three surviving ground-floor doorways (03, 04 and 05), all in the north wall, show diagonal chamfer-stops (Fig. 4b). Doorway 03 was the main entrance, giving on to the cross-passage; the presumed southern entry opposite was removed during Phase 2. The passage was always wide, to accommodate a second entry 04, to the undercroft stair, which shows Phase 1 detail but now has a square head. These access arrangements forced the passage beyond the cross-wall, instead of the normal location in the ‘low’ end bay of the hall, meaning that it lies beneath the first-floor chamber. The standard two-door arrangement in the cross-wall, between hall and service rooms, was therefore unnecessary and the two doorways here are not contemporary. One lies centrally, 06, and is likely to originate in Phase1, although later widened and given an elliptical head of post-medieval form (Fig. 4c). The hall is open to its gabled roof. A third Phase 1 doorway 05, now blocked, led from the ‘high’ end to the former northwest wing. Few other original features survive, while the collar-rafter roof is from 1879-80. The Phase 1 service end was the same width as the hall, beneath a continuous roof line. The internal layout has been lost, but services typically comprised a pantry and buttery; the present partitions are from 1879-80. In addition, the east wall has been much disturbed and rebuilt, including all windows. As in most end-halls of the period, the services appear to have been overlain by a residential chamber: at first-floor level, the cross-wall shows a doorway 07, with a segmental head, blocked to form a squint during Phase 2 (Fig. 4d), through which the chamber was presumably entered from a timber stair in the northeast corner of the hall – confirming that fireplace 15 here was a later insertion (see below). Access arrangements show that the former northwest wing was contemporary with the hall and undercroft. It had gone before 1879 when a new wing was built (Cobb 1880, 249), apparently on the same foundations meaning that the earlier wing ran north-south with roughly the same dimensions as the present kitchen wing (Fig. 1). Its replacement was demolished in 1979 (Beddall-Smith 1982). a: from east; b: from north. a: undercroft, facing west; b: main entry, diagonal chamfer-stop; c: hall, facing east; d: blocked first-floor doorway 07, from east. This phase can be distinguished by the use of roughly squared and coursed limestone rubble. It represents the southward extension of the service end to form a cross-wing with the hall, and is clearly secondary: a full-height vertical joint can be seen in the east wall (Fig. 3a). The new wing formed an L-plan with the hall, projecting four metres from its south wall with an entry 08 in its west face, blocked in 1979. Phase 2 door surrounds are like those in Phase 1 but lack the chamfer-stops. The cross-wall between hall and passage was given a very similar blind arch, which partly blocks the Phase 1 first-floor doorway (Fig. 4c). A relieving arch, it supported new side-walling above, confirming that the extended cross-wing was given a separate, north-south roof. The central doorway shown in the hall south wall, in Fig. 5, had a surround of Phase 2 form that, in 1950, was re-used as a window 13 in the west wall (Listed Building report). The first-floor chamber is now entered from a post-medieval newel stair (see below), while internal divisions and windows are modern. Surviving from Phase 2 are the conversion of the hall entry 07 into a squint, and the insertion of a second 14 (Figs. 4c, 4d). Such squints are not uncommon in late-medieval chambers, from which activity in the hall could be supervised (Wood 1983, 55, 137; Emery 2006, 116, 579). The roof is now gabled to the north, but half-hipped to the south where a parapet, built 1879-80, was removed in 1979 (Beddall-Smith 1982). Monkton Fig 5 (from Turner 1853, between pp. 320-1). Published dates span the fourteenth-fifteenth centuries, but form and detail suggest that both phases of the Old Hall belong to the early/mid-fifteenth century. Phase 1 detail is limited to the diagonal chamfer-stops which are comparable with those in the early/mid-fifteenth-century hall at Scotsborough, near Tenby (Davis 1990, 28, 31), and in domestic work from the fifteenth and sixteenth centuries elsewhere in south Wales (see eg. RCAHMW 2000, 91, 329). Monkton’s vaulting is unusual in Pembrokeshire, which is a county of barrel-vaults; where present, rib-vaults are usually late medieval. There are exceptions: the similar rib-vaults in the castles at Carew and Newport are normally dated to c.1280-1300 (King and Perks 1964, 303; Browne and Percival 1992, 23, 31; Goodall 2011, 455). But the others are rather later, from the late fourteenth and fifteenth centuries, including a rib-vault at Pembroke St Mary nearby (Lloyd et al. 2004, 45-6, 198; Scourfield 2002, 600-1). While undercrofts were widely used in late-medieval Pembrokeshire, they are unusual in end-halls like Monkton, cf. Scotsborough, Pricaston and Flimston (Davis 1990, 28-32; Parkinson 2002, 576 et al. ), although they occur in the unwinged halls at nearby Angle Castle, St Deiniol’s (Penally) and Whitewell (St Davids). 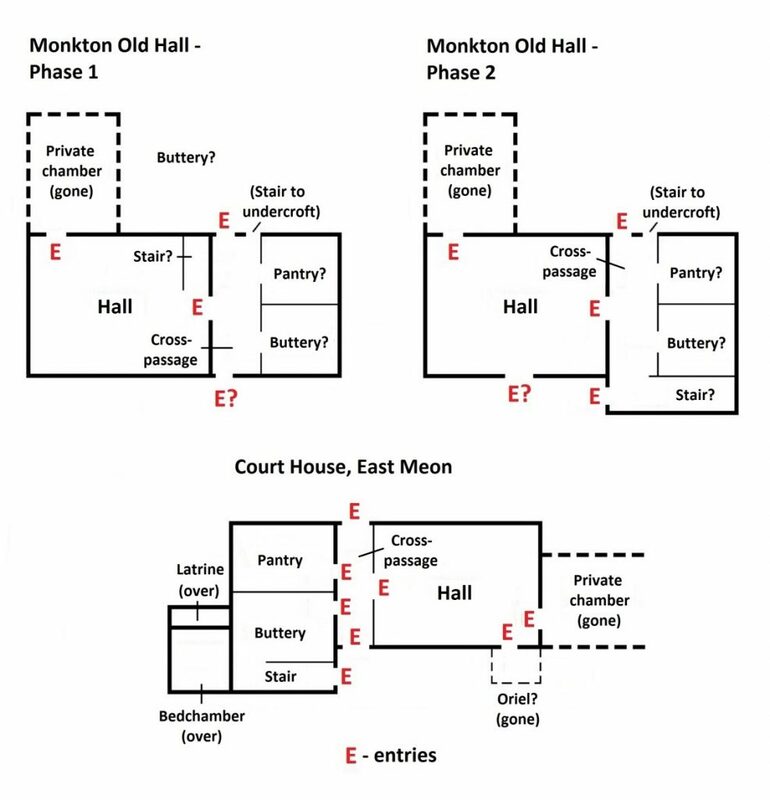 Monkton’s Phase 1 hall was rectangular in plan with services of the same width, as at nearby Pricaston which has been dated to the fifteenth century (Lloyd et al. 2004, 164). However, the L-plan adopted during Phase 2 is more typical of the region, cf. Scotsborough (fifteenth-century: Davis 1990) and Flimston (late-fourteenth or fifteenth century: Parkinson 2002, 576; Lloyd et al. 2004, 54, 163-4); houses of this type continued to be built into the early sixteenth century (Emery 2000 and 2006, passim; Smith 1988, passim). Though the former northwest wing gives the Old Hall a more complex ‘reverse end-wing’ plan (Fig. 6), it derives from the pre-existing Phase 1 arrangement. Fig. 6: Comparative Monkton Fig 6. sketch plans of Monkton Old Hall and Court House, East Meon. The Phase 2 entry to the cross-wing 08 is, unusually, at right-angles to the passage, and is a clue to the Old Hall’s function. An identical arrangement is seen at Court House, East Meon (Hants. ), an end-hall which in many other respects is similar to the Old Hall (Fig. 6). It was built 1395-7 as a courthouse and lodging for the Bishop of Winchester’s manorial steward (Roberts 1993, 457, 463), and the cross-wing entry led onto a straight timber stair, to provide separate, external access to the manorial courthouse on the first floor (Emery 2006, 333-6). This arrangement was used elsewhere during the period (ibid. 107-8, 557-60) and appears to have existed at Monkton, where the services may have been extended to the south, with a lateral doorway 08, to house a similar straight stair. The Phase 2 chamber may then have been a courthouse, perhaps accessed solely from outside as at East Meon; the stair may not have communicated with the cross-passage so access to the hall, from the south, was perhaps now furnished by the doorway shown in Fig. 5. A shift towards a more administrative function is implied. As at East Meon, the Old Hall nevertheless retained a residential wing from the earlier phase (Fig. 6). 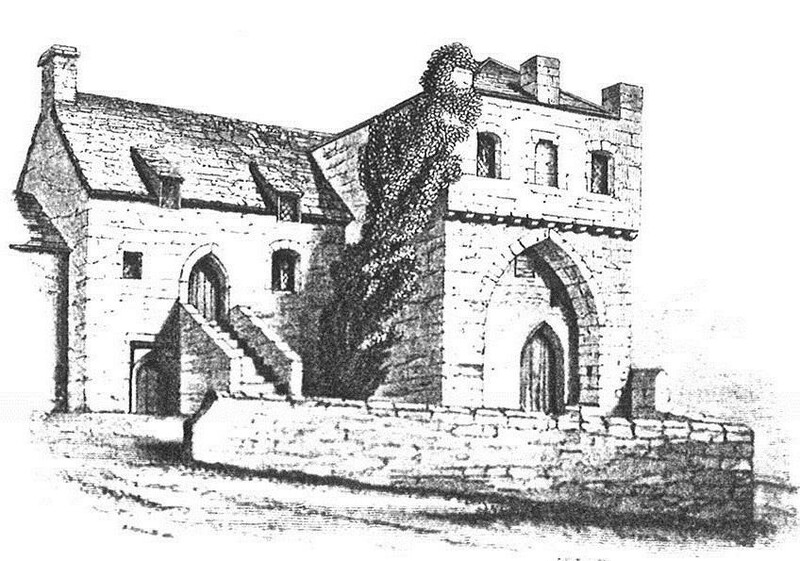 Doubts were cast, by Beddall-Smith (1982), on the antiquity of the blind arch in the cross-wing south wall, but it is suggested on John Speed’s plan of c.1610 and clearly shown in an early nineteenth-century drawing by Charles Norris (at Cardiff Central Library; and see Fig. 5). It appears deliberately to emulate a gatehouse – a ‘monumental’ arch facing the approach from Pembroke (Parkinson 2002, 553). The fashion for gatehouse mimicry began in the 1390s with the façades of Westminster Hall and Old Wardour Castle, Wilts. (Goodall 2012, 16), and was a feature of tower-house design in early fifteenth-century Co. Down, Ireland (Jope 1966, 120-1). The better-quality masonry around the Monkton arch, queried by Beddall-Smith, merely denotes that this was a ‘show’ front. Cobb suggested that it may originally have had a crenellated parapet, though no evidence is given (Cobb 1880, 250). Its corbel-tabling is characteristic of Pembrokeshire from the fourteenth to the seventeenth century and cannot be closely dated. Hall fireplaces 15 and 16 are later insertions, and it may originally have been heated by a central hearth as at numerous fifteenth-century gentry houses including East Meon (Emery 2006, 334 and passim). Monkton Old Hall, and priory, had been acquired by the Earls of Essex by the late sixteenth century (Owen 1897, 298 and n. 3, 305), under whom the kitchen wing was probably soon added. It is demonstrably a later addition, visibly butting against Phase 1 walling but in similar random rubble (Fig. 3a). Many houses of the fifteenth century lacked an integrated kitchen, including those of the highest status like East Meon (Roberts 1993, 478). They were not widely adopted in Wales until the seventeenth century (Smith 1988, 231), often as right-angled wings like Monkton, where the massive, square end-stack 24 is of late-fifteenth to seventeenth-century type (Turner 2000, 47); the similar kitchen wing at Scotsborough is regarded as sixteenth- or seventeenth-century (Davis 1990, 31). The Monkton wing’s upper storeys are accessed from a newel stair 25, contemporary with the wing and showing wide landings at the new floor levels; the entry to the medieval first-floor chamber 17, in contrast, straddles three risers and is roughly hacked through. Blocked fireplace 15 in the hall north wall, and its bold lateral stack, may be contemporary, and skews the north wall somewhat: the cylindrical chimney is post-medieval (Parkinson 2002, 573). Also infilled is the adjoining lateral outshut 18. A common feature of ‘yeoman’ houses in sub-medieval Pembrokeshire where, though of uncertain function, they are normally associated with fireplaces (Smith 1988, 24), such outshuts imply a decline in status at Monkton. A second doorway 19 in the cross-wall has a four-centred surround of ‘Tudor’ character, entirely unlike the other entries at Monkton and suggesting change in the use of the service area; it is now partly blocked. This change of use is also implicit in the large chimney-breast 20 which is visible externally, at ground-floor level, in the cross-wing east wall (Fig. 3a). It crosses the division between buttery and pantry, so belongs to a period when the two had become united as a single space. End-wall fireplaces were not characteristic of hall-houses in medieval Wales (Smith 1988, 67); the one at nearby Lydstep is unusual and may be a post-medieval insertion (Ludlow 1996, 18), as suggested at Monkton. The Essex family retained ownership until 1814, during the course of which the building was leased to multiple tenants and divided into individual dwellings; stylistically, the smaller windows are of this period, and their random distribution reflects the new internal arrangements. New fireplaces were inserted in the southeast corner of the cross-wing (12), and the hall west wall. 1850s-60s (Barnwell 1868, 70-1; Fig. 5); its triangular head is clearly post-medieval. Undercroft north wall fireplace 22 is also post-medieval, as is the narrow-splayed light 23 in the east wall which cuts through chimney-breast 20. The superstructure was also re-fenestrated by Cobb, often adapting existing openings. In the hall west wall is a hooded fireplace 16, dated variously to the fourteenth or sixteenth century; the later date is favoured here. It was moved, in 1979, from the south wall of the first-floor chamber, to utilise a post-medieval chimney. It was noted at the time that the chamber walling was, at a little over half a metre, far too thin for the fireplace to have been an original feature and its chimney-stack was post-medieval (Beddall-Smith 1982), while a blocked window is shown here in Fig. 5. It may be that the fireplace was brought in from elsewhere, sometime before the early nineteenth century when the chimney in Fig. 5 was shown in Charles Norris’s drawing. The Old Hall is normally regarded as a guest-house belonging to Monkton Priory (Emery 2000, 681; Parkinson 2002, 553; et al. ), which was founded in 1098 as an ‘alien’ daughter-house of the Benedictine abbey at Séez, in Normandy, and was also a parish church. Some of the 150 or so alien priories in England and Wales, by c.1300, were large, wealthy and influential. Many others, however, were relatively small and poorly-endowed, among them Monkton which had an annual revenue of £127, three-quarters of which came from its ‘spiritualties’ or dependent benefices (Caley et al. 1846, 321-2). It was the centre of an ecclesiastical manor of around 2,500 acres (Round 1899, 237-8). Monastic guest-houses took two main forms: a communal guest-hall for lower-status visitors, or a more private lodging, for aristocratic guests, which could be ‘virtually indistinguishable from a secular manor house’ (Emery 2000, 40). However, as visitors were served primarily by the monastic community (Kerr 2001, 106-8), guest-houses normally – but not always – lacked the pantry and buttery suggested by the arrangements at Monkton. And Benedictine guest-houses invariably occupied the monastery itself, usually within or near the west range (Wood 1983, 23, 25, et al. ), unlike the Old Hall which lies outside the precinct. Nothing can now be seen of Monkton’s monastic buildings, which lay north of the priory church. 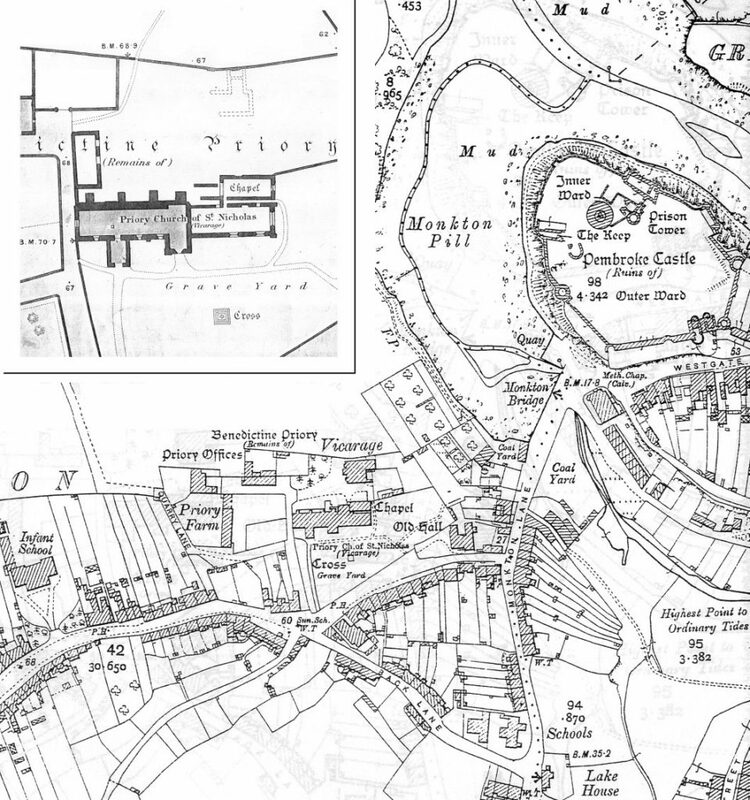 But nineteenth century maps show a large, rectangular building on the west side of the presumed cloister (Fig. 1, inset); clearly ruinous, and not apparent in early prints, it was removed when the vicarage was built in 1893 (Fig. 1; see Lloyd et al. 2004, 297). Such a large building may have represented combined accommodation for the prior and guests, as in Benedictine west ranges at Battle Abbey (Sussex), Exeter Priory and many others (Emery 2006, 306-8, 463, 551-3). As hospitality was central to the Benedictine rule (Kerr 2001, 97), it may be assumed that provision was made for guests in all but the smallest, non-conventual houses. Some of the wealthy monasteries established hostelries outside their precincts, relieving pressure on their guest-houses. But, unlike Monkton Old Hall, these hostelries were arranged communally with numerous chambers, often grouped around a courtyard along with stabling (Pantin 1961, 166-91). And Monkton Priory was not wealthy. Unlike many of the smaller alien houses (Graham 1948, 47-9), it does, however, appear to have been conventual: both a prior and sub-prior were recorded in 1284 (Martin 1885, 787-8) while further claustral buildings, to the northeast of the west range, were also lost in 1893 (Fig. 1, inset). The priory was moreover able, at some point, to finance a major building campaign in which its chancel was enlarged, presumably to provide more space for the choir monks. Restoration has made this work difficult to date – the fourteenth century is generally favoured (eg. Lloyd et al. 2004, 296; Listed Building report), based on the piscina, and a niche, which are in the Decorated style used by Henry Gower, Bishop of St Davids 1328-47 (Williams 1981, 10). While the scale of the chancel, and the size of its windows, would be consistent with this dating, the piscina and niche may be secondary insertions: the present window tracery, from 1887-95, is in a thirteenth-century Geometric style that may have been influenced by surviving detail. In addition, as an alien priory paying an annual pension (or apport) to a French mother-house – from which its community predominantly came – Monkton’s assets were periodically seized by the Crown during the fourteenth-century wars with France, ostensibly as a security threat but in reality for financial purposes (MacHardy 1975, 133). The terms of these seizures became more severe through time and Monkton seems to have escaped the first, from 1295 to 1303, when the prior received several grants (Cal. Pat. Rolls 1330-34, 67-8). But the house was clearly in no position to pay the fine required to avoid seizure during 1324-7 when its apports, and ‘temporalities’ (lands and properties), were sequestered (Morgan 1941, 205; Cal. Close Rolls 1327-30, 1). The terms of the third seizure, of 1339-60, were harsher still. The aliens’ spiritualities were also seized (Cal. Fine Rolls 1337-47, 176, 267), wiping out most of Monkton’s income, while smaller houses began to be committed to private custodians (Morgan 1941, 206). Monkton was an early victim of this measure, being farmed out in 1339 (Cal. Close Rolls 1339-41, 111), but the prior was soon re-appointed (Cal. Pat. Rolls 1338-40, 301). Monkton, nevertheless, remained conventual, and monks are mentioned in 1339-40 (ibid. ; Cal. Pat. Rolls 1340-43, 51). But the fourth, long seizure of 1369-99 saw restrictions placed on the arrival of new French monks (Morgan 1941, 206). It has been suggested that ‘the abbot of Séez cut his losses and withdrew [Monkton’s] small community’ (Cowley 2002, 351). But the priory instead seems to have struggled on, surviving an order, of 1377-8 (McHardy 1975, 137-8), that demanded the expulsion of all non-conventual communities. The preliminary valuation records that Monkton’s prior had retained custody including, unusually, its spiritualities, which were normally retained by the Crown (Caley et al. 1846, 321-2). Monks are not mentioned but, as at many other houses, chaplains had been appointed to augment the community. The prior’s custody was confirmed in 1379 (Cal. Close Rolls 1377-81, 181), but in 1387 Monkton was relinquished to Sir William Beauchamp, custodian of Pembroke Castle and lordship (Cal. Pat. Rolls 1385-89, 350-1). Beauchamp was required to provide for the prior and chaplains and maintain the priory buildings, but his record at Pembroke Castle – which was allowed to fall into decay (Evans 1957, 198-200) – suggests the latter obligation was not fulfilled. A monk was recorded in 1381 (TNA, PRO E/179/21/9), but the prior died in around 1390 (Isaacson 1917a, 142-5) and Monkton was exempted from the 1395 levy on alien houses (Laws 1909, 199); this suggests that it was no longer regarded as monastic. The 1380s-90s saw widespread disposal of alien priories (McHardy 1975, 139), while only the largest of them could afford the ‘charters of denization’ which permitted their survival as British houses (Morgan 1941, 206-7). The Lancastrian regime was initially more lenient: in 1399, with England and France at peace, King Henry IV ordered the restoration of many alien houses (Graham 1930, 115), including Monkton. Beauchamp was relieved of its custody, a prior from Séez was installed and the house was reconstituted, paying apports to the king, with the rider – common to all restorations – that it must be fully conventual (Cal. Pat. Rolls 1399-1401, 71). But its property suffered at the hands of Glyndŵr (Cal. Fine Rolls 1399-1405, 241) and then, at the close of 1403, it fell victim to a new seizure (Isaacson 1917a, 304-5), presumably because of French association with the rebellion. And so, in 1404, it was again granted to a private individual (TNA, PRO E/106/11/1) and this time ceased to be monastic, becoming a secular manor. Its fourteenth century history suggests that a substantial building like the Old Hall is unlikely to have been built by Monkton Priory. The manor had reverted to direct Crown control by 1408 (Isaacson 1917b, 412-13), when it was granted to Henry IV’s knight Francis Court (Wylie 1894, 309 and n. 3). Court had already been granted Pembroke Castle and lordship, on condition that he was resident in the lordship and maintained its defences against Glyndŵr (Cal. Pat. Rolls 1401-05, 315). After his death in 1413, Pembroke and Monkton were granted to King Henry V’s brother, Humphrey (Cal. Pat. Rolls 1413-16, 170), soon to be created Duke of Gloucester and Earl of Pembroke. A statute of 1414 decreed that the seizure of undenizened alien houses would be permanent (Morgan 1941, 209); about forty of the sixty-five or so that remained in England and Wales closed immediately (calculated from Knowles and Hadcock 1971), and Humphrey received full tenure of ‘the manor called la priorie of Pembroke’ (Cal. Pat. Rolls 1416-22, 129; Strachey 1771, 443-4). The aim of the statute was that the suppressed houses should endow other religious foundations and colleges (Morgan 1941, 210) and, although many remained under lay farmers for many years before this took place (Knowles and Hadcock 1971, passim), Humphrey’s full grant, for life and ‘in tail’ (ie. inheritable), was unusual. In 1440, a commission was appointed to deal with alien houses still in lay custody. Humphrey, by this time, had fallen from favour and, although he held it by full grant, was pressured to donate Monkton to either Eton or King’s College, Cambridge (Riley 1872, 26-7, 70, 266). However, he instead chose St Albans Abbey, of which his close friend John Wheathamstead was abbot, intending that Monkton’s revenues should endow an obituary chantry and two priests for his soul (Caley et al. 1819, 202 and n.). Finally transferred in 1443 (Riley 1872, 47-50), Monkton was eventually re-founded (in 1471?) as a cell of St Albans (Riley 1873, 96-7, 211-12), under a new succession of priors, which survived until the dissolution of the abbey in 1539 (Caley et al. 1846, 320). This reconstitution was unusual, but we know little about the nature of Humphrey’s interests at Monkton – nor whether he had been granted it purely for its revenues. A religious presence had been maintained: Humphrey was to find ‘four chaplains to celebrate divine service every day in the said priory’ (Strachey 1771, 443-4). While this was a requirement for alien houses still in temporary lay custody, Monkton was under full tenure. So it is possible that Humphrey’s chaplains maintained a Lancastrian chantry, as at the alien Wilmington Priory in Sussex (Page 1973, 122-3). And there may have been other motives behind the 1443 grant. Humphrey had no heirs and was looking unlikely to produce any, and in the same year had been persuaded to make a reversionary grant of Pembroke in the event of his death (Owen 1918, 50-1); St Albans may therefore have received Monkton mainly by virtue of this process. A disused deer-park was moreover recorded at Monkton in c.1600 (Owen 1897, 401 n. 1). Only the wealthier monasteries could maintain parks (Mileson 2009, 25, 65); the alien priory at Abergavenny is known to have had one (Caley et al. 1846, 613-7), but it was probably established after the house received a new British community, and considerable lay investment, in the mid-fourteenth century (see Graham 1930, 110, 117). No park is mentioned at Monkton in any documents relating to the priory (the Valor etc. ), and I therefore suggest that it may have been laid out by Duke Humphrey; significantly, the Pembroke earls’ original park, at St Florence, had become disused by the 1380s (Evans 1957, 188-9). A ‘park’ place-name was recorded at Monkton in 1458 (Owen 1918, 263), but its precise location is unknown (see Pritchard et al. 2015); the priory demesne, 98 acres in extent (Caley et al. 1846, 321-2), seems, however, to have been located north of the priory where the park might be expected. Like the priors before him, Humphrey employed a manorial steward; the steward’s court is mentioned in 1378 (Caley et al. 1846, 321-2). These courts were for the priory’s lay tenants and were held, accordingly, outside the monastic area, perhaps in the porch of the parochial church nave, which was built c.1200 (Thurlby 2006, 107) – perhaps accounting for its size – or even in the open air. Is it possible that Humphrey was responsible for Monkton Old Hall, as accommodation for his steward? The Phase 1 building was furnished with a first-floor chamber, while the northwest wing may have been reserved for Humphrey’s use as in the similar Court House, East Meon, where the private wing provided occasional accommodation for the bishop and chosen companions, as a rural retreat with hunting and hawking in his nearby parks (Roberts 1993, 478; see Fig. 6). The Old Hall’s prominent inter-visibility with Pembroke Castle, which is faced by its entrance front, may by itself imply a close relationship between the two. 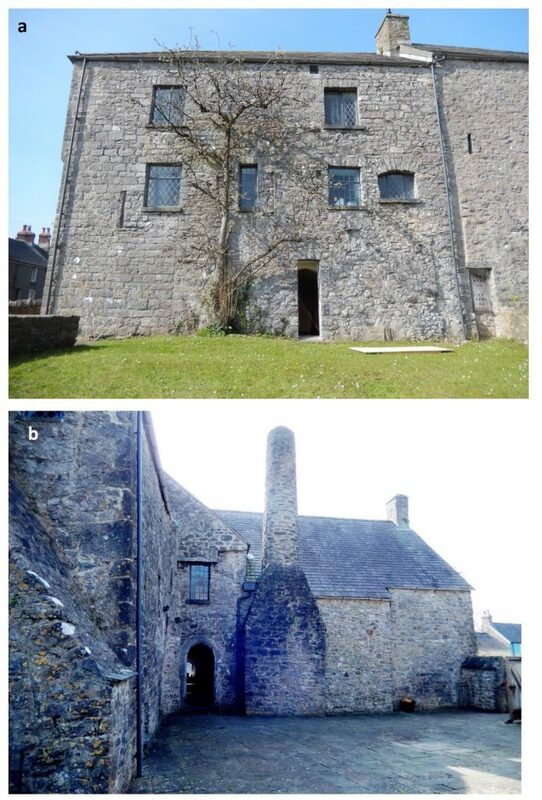 Humphrey had the resources to build a rib-vault, unusual in Pembrokeshire, while a stair from the northwest wing provided private access to the (wine)-cellar, as in Pembroke Castle’s solar (Day and Ludlow 2017, 74). Humphrey is recorded in southwest Wales in the early 1440s, where he had recently been appointed Justiciar (Cal. Pat. Rolls 1436-41, 452). No other visits are certainly known, but he had by this time formed strong bonds with his Pembrokeshire tenants, many of whom appeared in his retinue (Turvey 2002, 381-2), implying an early interest if not a physical presence. And generally, an absence of recorded visits does not mean that no provision was made for them, while Humphrey undertook building projects at many of his other properties (Goodall 2011, 351, 360). His regional seat at Pembroke Castle had moreover become increasingly administrative and penal in character, its domestic accommodation neglected during a succession of minorities (Evans 1957, 198-200); similar circumstances at other castles during the late-medieval period saw a widespread movement, by nobles, into more agreeable residences nearby (Thompson 1987, 12; Mileson 2009, 88). These are possible contexts for the Old Hall’s construction. The building was redesigned and apparently repurposed during Phase 2. The service wing was extended, probably to provide public access to the first-floor chamber from the throroughfare to the south (Fig. 6), suggesting that the chamber, as at East Meon, was used as a courthouse. The building was thereby turned around, with a new ‘show’ frontage to the street, and gatehouse mimicry that suggests the highest status – if not royal associations – rather than influence from Ireland where its distribution is restricted. Other detail is very similar to Phase 1, suggesting the two phases are close in date, and comparable to that at East Meon. Unlike East Meon, however, there is no evidence at Monkton for either bedchamber or latrine in the Phase 2 chamber; unless they lay to the north, and were replaced by the kitchen wing, it may not have been fully residential. So the possibility exists that the steward took over the northwest wing. This may coincide with the erection of the winged ‘mansion-house’ that formerly lay within the outer ward at Pembroke Castle, away from the noise and bustle of the inner ward. Of mid-fifteenth-century form, at the earliest, it was perhaps built by Duke Humphrey (Day and Ludlow 2017, 104). Monkton Old Hall was possibly built in the early fifteenth century by Humphrey Plantagenet, earl of Pembroke, as a lodging and then a courthouse for the steward of his manor of Monkton. A further apartment, now gone, may have been reserved for the earl and his closest companions. The former deer-park at Monkton, probably established by Humphrey, may provide a context for such accommodation, along with the bustle and neglect recorded at Pembroke Castle. Thanks to the Landmark Trust, Richard Suggett (RCAHMW) and Roger Turvey for assistance and advice. Barnwell, E. L., 1868 ‘Domestic Architecture of South Pembrokeshire’, Archaeol. Cambrensis third ser., 14/53, 70-84. Beddall-Smith, L., 1982 ‘Monkton Old Hall’ (typescript held in National Monuments Record, NPRN 22328). Browne, D. M., and Percival, D., 1992 Newport Castle: An Architectural Study (Aberystwyth: RCAHMW). Cardiff Central Library, Charles Norris Drawings Vol. 8, No. 285. Cobb, J. R., 1880 ‘Old Hall, Monkton, Pembroke’, Archaeol. Cambrensis fourth ser. 11/44, 248-52. Cowley, F. A., 2002 ‘The Regular Clergy, 1093-1540’, in R. F. Walker (ed. ), 338-359. Davis, P. R., 1990 ‘Scotsborough House, a survey of a ruined mansion near Tenby’, Archaeology in Wales 30, 28-32. Emery, A., Greater Medieval Houses of England and Wales, 1300-1500 (Cambridge University Press). Vol. 2, East Anglia, Central England and Wales (2000). Vol. 3, Southern England (2006). Evans, D. L. (ed. ), 1957 Calendar of Inquisitions Miscellaneous, 4 (London: HMSO). Goodall, J., 2011 The English Castle 1066-1650 (New Haven and London: Yale University Press). Goodall, J., 2012 ‘The English Gatehouse’, Architectural Hist. 55 (2012), 1-23. Graham, R., 1930 ‘Four Alien Priories in Monmouthshire’, Journ. British Archaeol. Assoc., new ser. 35, 102-121. Graham, R., 1948 ‘The Cluniac priory of Saint-Martin des Champs, Paris, and its dependent priories in England and Wales’, Journ. British Archaeol. Assoc. sixth ser. 11, 35-59. Jope, E. M., 1966 An archaeological survey of Co. Down (Belfast: HMSO). Kerr, J., 2001 ‘Monastic Hospitality: the Benedictines in England, c.1070-c.1245’, in J. Gillingham (ed. ), Anglo-Norman Studies 23; Proceedings of the Battle Conference 2000 (Woodbridge; Boydell), 97-114. King, D. J. C. and Perks, J. C., 1964, ‘Carew Castle, Pembrokeshire’, Archaeol. Journ. 119, 270-307. Knowles, D., and Hadcock, R. N., 1971 Medieval Religious Houses in England and Wales (London: Longman). Laws, E., 1909 ‘Notes on the Alien Benedictine Priory of St Nicholas and St John the Evangelist in Monkton, Pembroke’, Archaeol. Cambrensis sixth ser. 9/2, 165-202. Monkton Old Hall (Building ID 6334). Monkton priory church (Building ID 6330). Lloyd, T., Orbach, J. and Scourfield, R., 2004 The Buildings of Wales: Pembrokeshire (New Haven and London: Yale University Press). Ludlow, N., 1996 ‘Lydstep Palace: archaeological recording and structural analysis’ (unpublished Dyfed Archaeological Trust report). Martin, C. T. (ed. ), 1885 Registrum Epistolarum Fratris Johannis Peckham Archiepiscopi Cantuariensis, 3 (London: Rolls Series). McHardy, A. K., 1975 ‘The alien priories and the expulsion of aliens from England in 1378’, Studies in Church Hist. 12, 133-41. Mileson, S. A., 2009 Parks in Medieval England (Oxford University Press). Morgan, M. M., 1941 ‘The Suppression of the Alien Priories’, History 26, 204-12. Owen, H. (ed. ), 1897 The Description of Pembrokeshire by George Owen of Henllys, Lord of Kemes, 2 (London: Cymmrodorion Record Series 1). Owen, H. (ed. ), 1918 A Calendar of Public Records Relating to Pembrokeshire, 3 (London: Cymmrodorion Record Series 7). Page, W. (ed. ), 1973 A History of the County of Sussex 2, (London: Victoria County History). Pantin, W., 1961 ‘Medieval Inns’, in E. Jope (ed. ), Studies in Building History: Essays in recognition of the work of B. H. St J. O’Neil (London: Odhams Press), 166-91. 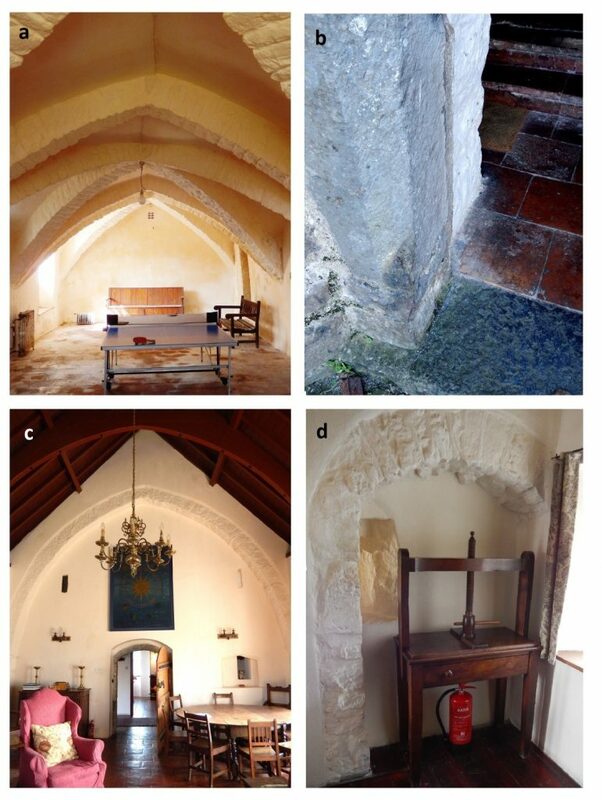 Parkinson, A. J., 2002 ‘Medieval Domestic Architecture in Pembrokeshire’, in R. F. Walker (ed. ), 548-86. Pritchard, H., Ings, M. and Page, M., 2015 ‘Medieval and early post-medieval deer parks’ (unpublished Dyfed Archaeological Trust report 2015/18). RCAHMW, 2000 An Inventory of Ancient Monuments in Glamorgan 3/1b: The Later Castles (London: HMSO). Roberts, E., 1993 ‘William of Wykeham’s House at East Meon, Hants.’, Archaeol. Journ. 150 (1993), 456-81. Round, J. H. (ed. ), 1899 Calendar of Documents Preserved in France, 1, AD 918–1206 (London: HMSO). 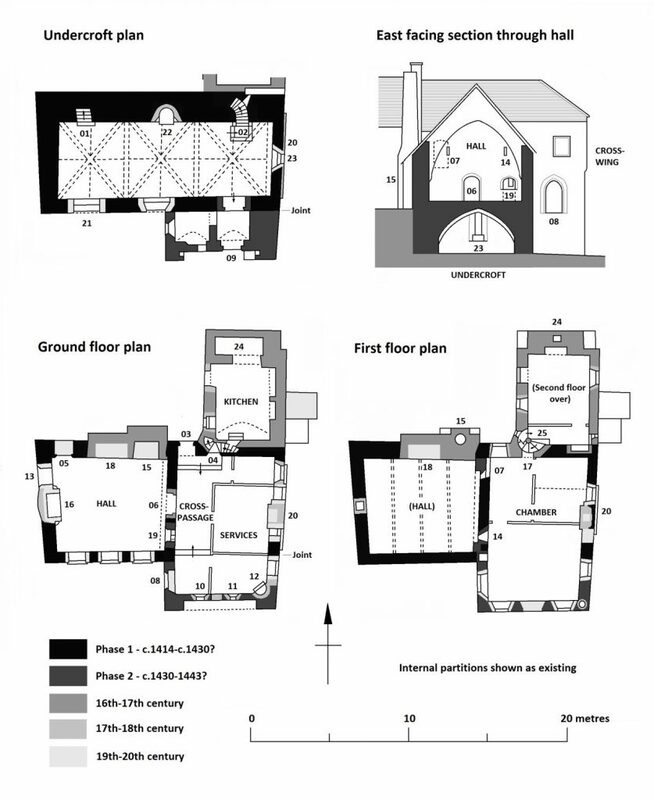 Scourfield, R., 2002 ‘Medieval Church Building in Pembrokeshire’, in R. F. Walker (ed. ), 587-606. Smith, P., 1988 Houses of the Welsh Countryside (London: HMSO). Strachey, J. (ed. ), 1771 Rotuli Parliamentorum, 4 (London: J. Strachey). TNA, PRO E/106/11/1 (valuation of Monkton in 1404). TNA, PRO E/179/21/9 (clerical tax return of 1381). Thomas, W. G., 1962 ‘Monkton Priory church’, Archaeol. Journ. 119, 344-5. Thompson, M. W., 1987 The Decline of the Castle (Cambridge University Press). Thurlby, M., 2006 Romanesque Architecture and Sculpture in Wales (Almeley: Logaston). Turner, R., 2000 Lamphey Bishop’s Palace/Llawhaden Castle (Cardiff: Cadw). Turner, T. H., 1853 Some Account of Domestic Architecture in England, 2 (Oxford: J. H. Parker). Turvey, R. K., 2000 ‘The Gentry’, in R. F. Walker (ed. ), 360-400. Walker, R. F. (ed. ), 2002 Pembrokeshire County History, 2: Medieval Pembrokeshire (Haverfordwest: Pembrokeshire Historical Society). Williams, G., 1981 ‘Henry de Gower (?1278-1347): Bishop and Builder’, Archaeol. Cambrensis 130, 1-18. Wood, M., 1983 The English Mediaeval House (London: Bracken Books). Wylie, J. H., 1894 History of England under Henry the Fourth, 2: 1405-1406 (London: Longmans, Green and Co.).